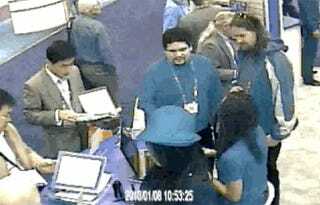 Click to viewI'm not saying you should try to steal anything from a trade show. That's just wrong. But if you absolutely have to, maybe you shouldn't start with the company that's there selling security cameras, hrrmmmm? Willy Wu is the idiot in question, and his target was the Swann Security visitor sign-in book. The Swann Security that makes home security products. Like, say, surveillance cameras. The kind that were all over their booth, and provided the wonderful video above.